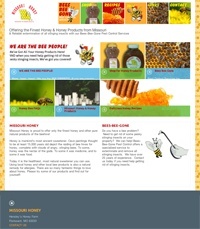 Missouri Honey sells homegrown honey and honey products and also provides Bees-Bee-Gone pest control services. For this ecommerce website we used a bright colorful color scheme with a fun honeycomb background design. The template features a unique layout with large animated color blocks.